1968 was a transitional year for Fender amps, with tone that was still pure Fender but a look that was brand new. With a silver-and-turquoise front panel and classy aluminum “drip edge” grille cloth trim, the Deluxe Reverb received a fresh new face as it remained the ideal recording and performing amp. Small, light and moderately powered, it produced big tube tone, with world-class Fender reverb and vibrato effects. 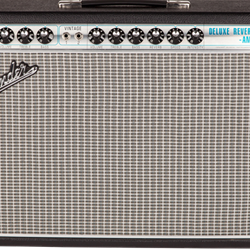 For countless guitarists ever since, the Deluxe Reverb has been the go-to amp for classic Fender sound. The ’68 Custom Deluxe Reverb Amp pays tribute to the classic look, sound and performance of Fender’s late-’60s “silverface” amps. In a special twist, both channels boast reverb and tremolo, and the “custom” channel has a modified Bassman® tone stack that gives modern players greater tonal flexibility with pedals. The amp also features quicker gain onset and reduced negative feedback for greater touch sensitivity. The ’68 Custom Deluxe Reverb’s single 12” Celestion® G12V-70 speaker also delivers a more distinctively rock 'n’ roll flavor.